Vintage 1940 Peridot and Diamond Ring. Platinum, non-marked. Vintage circa 1940. 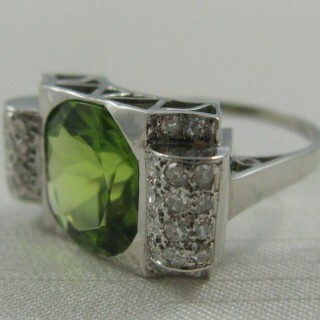 Set to the centre a large round cut peridot. The peridot measures approximately 4.50 carats. Peridot showing good colour. 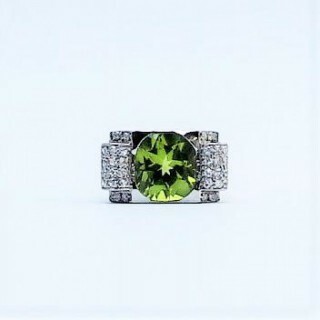 The peridot is complemented to either side with a scroll diamond set panel. Each panel is claw set with sixteen old cut diamonds. Decorative pierced out gallery. Plain shoulders. Plain band shank. 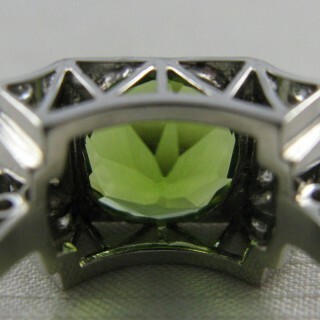 To the reverse the peridot and diamonds are set into open backed settings, this allows the light to shine through. The peridot measures approximately 10 mm across. The head of the ring measures approximately 14 mm width from outer edge of diamond panel to outer edge of diamond Panel by 10 mm length. The majority of our rings can be resized. 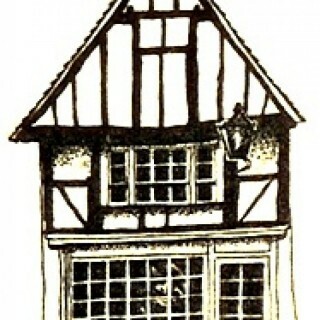 Resizing will be done at our expense and can take up to five working days. We suggest that a ring size is confirmed by a jeweller who has taken a ring measurement, given that there can be a difference in ring sizes on each hand. 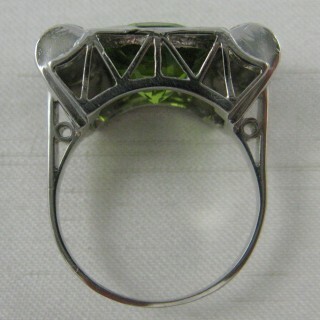 VINTAGE 1940 PERIDOT AND DIAMOND RING.